Not to be stereotypical, but my multiple food experiences in London haven't been mind-blowing; even if Indian food and Peking Duck in Bayswater are particular delicious (not English at all). 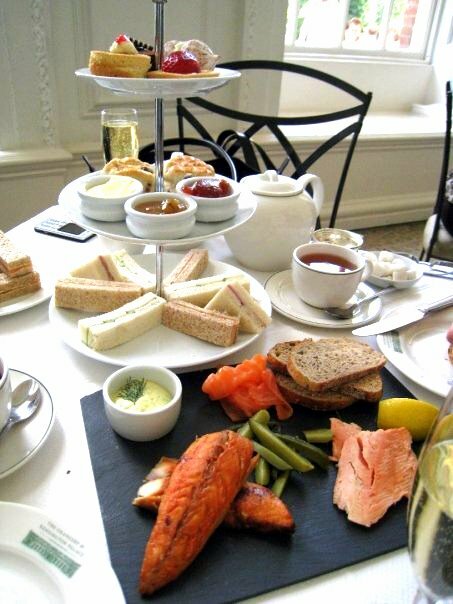 Traditional English food doesn't quite excite me...Unless you're talking about High Tea. The most influential female figures in my early development subscribe to a "ladies who lunch" mantra, and would bring us kids out for high tea almost every week. Between nibbles of scones and sips of milky tea, we would be regaled with highlights of petty gossip, sagely advice and competitive shopping deals. We would switch things up by going for the traditional English one day, Hong Kong yum cha the next, Peranakan kuehs the next.... Not to sound obnoxious, I know my high tea well. it was unpretentious and was located in the beautiful gardens of Kensington Palace...That said, Brown's offered free flow of delicious, buttery scones and petit fours but there really is so much carbs one can eat in the middle of the afternoon. TO does not take reservations and if you're going there on the weekends, be prepared for a substantial wait. UK Yelpers, god bless their hearts, have rated my favorite TO highly and it is no longer London's best kept secret. As of now, I have officially been to TO about 5 times, which explains why I have not explored other high tea establishments as much. With pillars set in a high-ceilinged and sunlit room, I always leave with refreshed and inspired airs. Each table is also set with a small potted orange tree and the silverware is pristine and impeccable. Preparing to attack.... Cousin Stef and aunt.